The thing to see here are sessile involucres. If the involucres were peduncled then we might think this was E. flavum. Coll. No. 1401.1, 8 Jun 2015, characters observed: Perennial, caespitose, to 10 cm. ; Leaves, basal, elliptic, petiole 10 mm. + blade 30 mm. × 12 mm. wide, adaxial greenish floccose, abaxial tomentose; Flowering stems, without a whorl of bracts mid-stem; Inflorescence, umbellate (simple, not compound); Involucre, sessile (not peduncled), 4.5 mm., hairy, teeth, very short; Flowers, (obscurely) attenuate at base; Perianth, 4.5-6.0 mm., bright yellow, hairy. Field Notes: Coll. No. 1401.1, 8 Jun 2016. 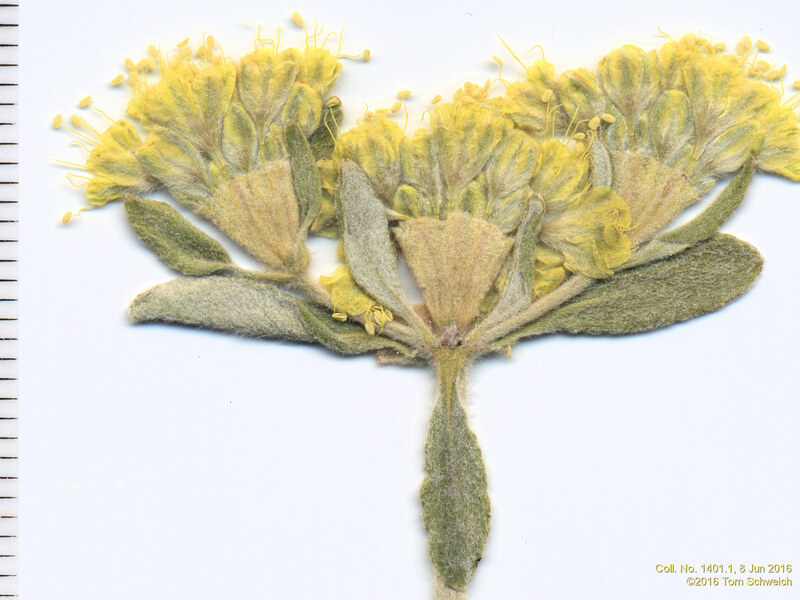 Other photos about Species - Polygonaceae or Eriogonum arcuatum.